The stem is erect and arises from an extensive system of tough and scaly un-branched, white, and succulent rhizomes (rootstock). The leaf is flat and linear, narrowing at the tip. It has a razor sharp margin with a hairy base. The flower head is composed of dense creamy-white or silvery-white silky hairs. It can produce up to 3,000 seeds and can be propagated by seeds and rhizomes. The plant can reach up to 1.5 m in height. Cogongrass forms a dense mat and produces plenty of leaves that make it nearly impossible for other plants to coexist. It can invade and overtake disturbed ecosystems by displacing a large variety of native plant species. The plants can easily attract fire. Burning them encourage new shoots. It is an alternate host forrust, damping-off, leaf blight, and for root knot nematode. It can reduce yields by up to 90% when not properly controlled. It is a very strong competitor for water, nutrients, and light because it sprouts and grows faster than most crops. 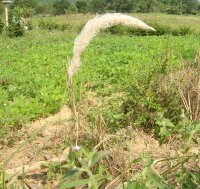 Cogongrass is used as a soil binder (to prevent soil erosion), animal feed, and herbal medicine. Studies show that cogongrass contains chemicals (has the allelopathic ability) that prevent the growth of other plant species and contribute to its invasiveness and extreme competitiveness. Koger Iii, C; Bryson, C. (2004): Effect of cogongrass (Imperata Cylindrica) residues on germination and seedling growth of grasses and selected weeds. Weed Technology. Vol. 18: pp. 236-242.